These past several weeks we’ve revisited Infinite City and Unfathomable City, and made our first foray into New York City with the Wildlife map. 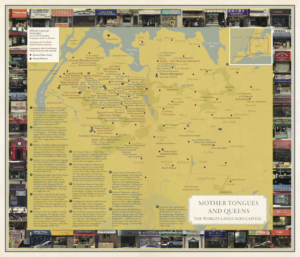 Today we’re celebrating Queens, the largest (in area) of the five boroughs of New York City, home to both of New York’s international airports, and host to the Queens Museum, the hosting venue for Nonstop Metropolis: A New York City Atlas‘ tie-in exhibition, Nonstop Metropolis: The Remix. Queens’ most defining characteristic, however, is that is the most ethnically and linguistically diverse place on the earth. With this blog post, we’re going to celebrate all that makes Queens what it is. Queue up Queens’ own, Nas, as you learn more about the borough. Queens is also home to more languages than any other place in the world. The Jackson Heights-Roosevelt Avenue subway station sits in the heart of America’s most linguistically diverse neighborhood: a place where people from the world’s linguistically rich countries—including India, Indonesia, Nepal, and the Philippines—converge in a single zip code. Coptic, the last descendent of the Egyptian language of the pharaohs, has not been a language of daily life for centuries, but lives in as a liturgical language among the Egyptian Christian congregants at St. Mary and St. Antonio’s Coptic Orthodox Church. Rikers Island, one of the world’s largest jails, holds new languages created by gangs to evade the authorities, as well as some of the first languages of the Americas, spoken by a handful of indigenous Mexican and Guatemalan prisoners who’ve effectively been stripped of their rights due to language barriers. These are just a few of the unique and incredible things about Queens. 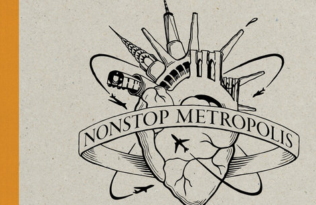 Nonstop Metropolis explores Queens from other angles: environmental, political, and culturally. Nonstop Metropolis: A New York City Atlas is the final volume in our trilogy of atlases by Rebecca Solnit, Joshua Jelly-Schapiro, Rebecca Snedeker, and a host of notable contributors. Following the publication of the critically lauded Infinite City (San Francisco) and Unfathomable City (New Orleans), we bring you this homage—and challenge—to the way we know New York City, an exquisitely designed and gorgeously illustrated atlas that excavates the many buried layers of all five boroughs of New York City and parts of New Jersey. Preorder your copy today.